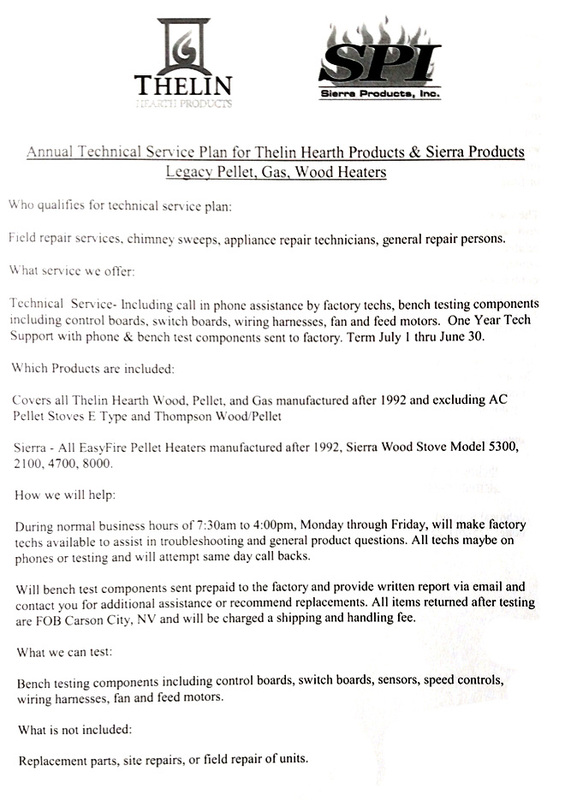 Thelin™ Company recommends all repairs be accomplished by a certified hearth products service company. Part selection and application is by purchaser. Any exchange or return require a "Return Merchandise Authorization" (RMA) and must be requested with in 30 days of receipt. Return parts are subject to our Terms and Condition of Sale and a 20% restocking fee. Parts carry a 90 day warranty from the date of sale excluding electronic and electric parts that could be damaged from installation. Orders are entered daily Monday-Friday during normal business hours. Please allow 3-5 business days for processing and shipping. Order confirmation and shipment tracking information will be provided through PayPal processing account. For updates or questions on a specific part ship and transit times contact Thelin™ Customer Service . Shipping & Handling Charges: THP ships all parts prepaid and charges $19.00 minimum shipping and handling fee for orders less than $249. Orders totaling $250 or more, shipping and handling charge is included. This applies for US lower 48 states. Alaska/Hawaii and International, contact customer service for specific shipping and handling charges. 00.1015.0082 Parlour Pellet Eastern Ser# 1780-5300 S/S Pre-Electronic Ign. 00.1015.0083 Parlour Pellet Western Ser# 1000-1779 S/S Pre-Electronic Ign. 00.0050.0102.1 Parlour Pellet, Gas & Wood Door Gasket 53" x 1/2"
00.0050.0102.2 Gnome Pellet & Gas Door Gasket 37" x 1/2"